We exhibit perfect gem of Old Pottery and work approximately 30 points which includes latest point. 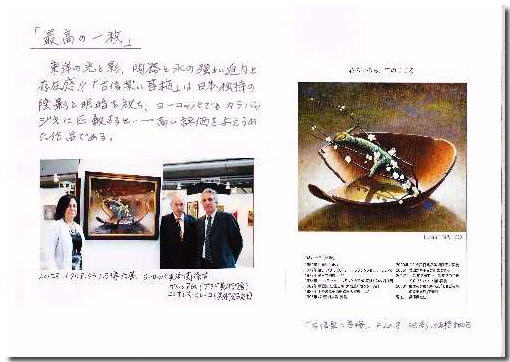 One piece of Kuki Saburo Oil Painting will be exhibited at Expo Milano 2015. We exhibit perfect gem of Old Pottery and work approximately 25 points which we created mainly on Spring Flower including Peony by now exhibition. We guide to have arrival inspection on spring day. Work which let the Beauty Of Japan fuse in Western technique that we learned in Paris on young day reminds person seeing of fresh impression. We exhibit approx. 30 points including the most new work. You draw flowers of the four seasons arranged in container of the sum by Oil Painting, and please enjoy many works expressed to feel of a material of earthenware closely. 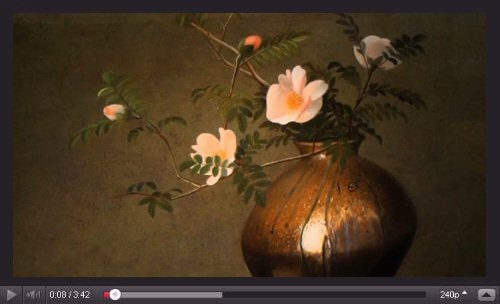 Kuki Saburo - Flower Life & Pottery Heart - on the Youtube! 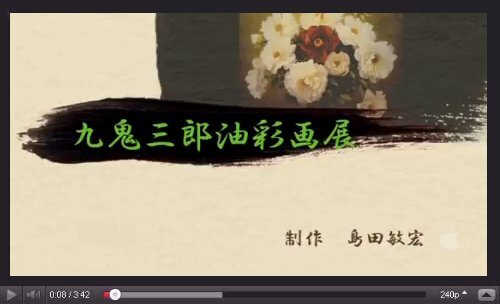 We guide so that inspection has the new world fusing in outlook on to be inherent in perfect gem of Old Pottery space and flowers, Japanese and Western painting style were met at this moment. We announce work and approx. 30 points of works including the most new work including vase of perfect gem coming up for the first time which described "Mount Fuji" in motif by now exhibition. We guide to have a look. While ancient people give many suggestions and joy to sympathize with to through work of Pottery after time of several hundred years, we continue describing charm of Old Pottery and the beauty of flower in motif while repeating tangle every day. It blooms with outlook on to be inherent in perfect gem of Pottery space, rotating season and feels mysterious charm to attract heart of the beauty in Japan ancient times and our heart in figure of flowers scattered together, and not to keep away. Did it not come from Japanese climate with the four seasons deeply if we called this Japanese sense of beauty? I am piled up with time when curiously it worked hard for the acquisition of the West classic law of painting among world image students in Paris that hakukaku did existence of this consciousness in oneself clearly. There was heart in hesitation and met pot of Old Bizen in Momoyama era in small art museum of Paris in such an occasion and shook heart with impression without sense of incongruity that was slightly delicate with one's sense that was Japanese disappearing in depth of the beauty that Rembrandt, Vermeer, work of great masters of the Louvre including co-low emitted while we were overwhelmed. We had a feeling that we saw direction that you should aim at. Thereafter we devoted ourselves to expressing brightness of each life in the subject in perfect gem of Old Pottery and combination of flower of season, and the challenge is not still over. We attach flower to ceramic ware of various parts of Japan and express work Giving Ease To Thing To Look At by oil painting. We arrive and guide to have a look. We hold chorus by Keiko Kuki. We learned oil painting image in Paris and felt beauty of the sum that we came back to Japan and felt particularly the beauty that perfect gem of Sue that passed through the times had with flowers arranged there when it was Japanese sense of beauty itself and have begun to describe it in motif in old days. Then we let the origin deepen feeling of those days more for more than 40 years and want to continue describing. We guide even now exhibition that does work which we created with such a feeling and has a look at arrival. We individualize beauty of flower which solid feel of a material such as soil taste of Pottery that bakes firmly, and was closed that combines caliber with floral art of season, and is described in stroke of the pen that it is oil shadow puppet exhibition of Saburo Kuki expressing the beauty of harmony, and is precise, luster of refuse is fresh and young, and seems to be vain still more. Please have a look at this opportunity. A Happy New Year we are taken care of in various ways during last year, and thank you and thank you would like in this year. New age holds private exhibition under the theme of The Beauty Of Charm & Flower Of Old Pottery with prayer for all of you to be splendid age. Neat and clean space that matched flower which bloomed in the four seasons with mind to be inherent in Old Sue. We draw the ultimate Japanese beauty that continues chasing The Inner Truth, and please see realistic description that is the truth height of oil painting. Solid feel of a material such as combination, soil taste of Pottery that bakes firmly, and was closed described in stroke of the pen that it is oil painting image exhibition expressing The Beauty Of Harmony, and is precise, luster of the sum is fresh and young with container and individualize beauty of flower with flower of season still more. We were brought up in environment that conflicted with ceramic art and tea ceremony and came to understand the Japanese old beauty deeply from the young time. We express The Beauty That We Arranged Taste Of The Four Seasons For Of Japan with oil painting image in tradition art, ceramic ware proud of to the world. Please enjoy work giving off unique brightness in current Japanese culture that the work reminds thing watching of fresh impression and harmonizes in Japanese and Western style oil painting.